I never intended to watch the movie, for one I am not a DC fan and two, I have scheduled for a general checkup on Sunday but I was over fasting, only the blood and urine were extracted as it did not strictly needs a 10-hour fasting. So I was able to evaporate early as I have expected. I was supposed to come back the next day for the remaining tests but this time, I was over sleep, lol. I mean, I started my fasting at 10PM, extraction time should be 8AM. I woke up 10AM, lol. Now, after I vacate the place, I was starving like hell, I haven't eaten for about 14 hours for that matter so I went straight to home. But I can't find available food and I'm not in the mood to cook, I was simply tired. So I texted a friend to accompany me for a lunch and promised to treat him for Man of Steel afterwards as not to decline my offer. At 5 minutes past 1, I'm on my way to Marikina. We agreed to watch the movie and have the lunch at Marquinton. I'm in a hurry because we're supposed to get the 2:05 showing. But guess what? As usual, I am late. The next showing time was 3:15 so while waiting we dined at Max's restaurant and it took 20 minutes for our order to be delivered. At 3:05, I asked for the bill while still chewing my last bit of food. By 3:10 we're on queue to the ticket booth. When my turn, I told the cashier for two tickets. She said, it's Php 512 Sir. I was raising my eye brows with a are-you-kidding-me and seriously? expression but still handed her the amount. We presented our tickets to the gate attendance and was surprised because she handed us the 3D glasses. A friend then exclaimed, "Oh that's why it's expensive, it's 3D". "Yeah, I was almost to comment the cashier that their movie cost more than that of Gateway Mall", I responded. We both bursting into laughter as we enter the theater. "This will be my first time to have experience the 3D movie", I told him. "Oh me too", he commented back. "Oh wow, the two ignorant, LOL", I added. When it was the time to put on the glasses, we're very excited. From time to time we have to remove the glass just to compare the difference. Lol, we were like an idiot commenting from time to time. Ang laki nga ng pagkakaiba (Indeed, there's a big difference), I said of which he also agree. The graphics is so crisp and edges are distinguishable. And when it zoomed it's like you can grasp with your own hands, it's getting nearer lol. I was invited to watch 3D movies before but I declined because I thought with the quality of our films these days, I don't think a 3D would make any difference. In short, it's not worth spending money with the quality with only a slight plus point from the normal/regular one. Pfftt... here comes the movie. Oh my gosh, it's a wow. It's super. The supporting casts are super. Russel Crowe is the father, Jor-El. And I never realized Kevin Costner is part of the cast so I was excited. He's playing Jonathan Kent (Clark father on earth), the last film I've seen him was with Renee Russo, I can't remember the title, lol. And ofcourse who can forget Diane Lane - Unfaithful was my favorite, lol. She's playing Martha Kent this time very far from Unfaithful if you ask me (lol) but she's a joy seeing in this movie. 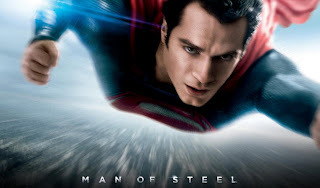 Man of Steel is action packed and it's a Father's Day movie. Sunday was Father's day, and the movie was perfect for the occasion. Jor El (Crowe) upon learning that Krypton is on the verge to destruction he made a plan to save Kal El. This, by sending to Earth. On earth, Kal El was raised by earthlings Jonathan (Costner) and Martha (Lane) Kent. Just like in Amazing Spiderman, Man of Steel is a reboot of Superman. The starts of Clark Kent story. And like in Amazing Spiderman, Jonathan Kent reminded me of Peter's Unca Ben. I mean, both men were being looked up by our two heroes. Both heroes are somehow guilty of their death for the reason that while they were helping other people they failed to save the person they cared most. And while Unca Ben is not aware about Peter's power, Jonathan on the hand knows exactly that the boy they raised is not of earth and that the boy has a power within him. And in order to keep Clark from safety, he don't want the boy displaying his power too soon. It's not the time yet, he would always tell Clark. He died protecting Clark true identity. This reboot Superman movie is one of the most anticipated movies of 2013, no wonder it's now the new title holder for the June biggest opening movie disposing Toy Story 3 after hauling $128.6M over the weekend. It placed 2nd behind The Hunger Games for the all time non-sequel movies. After watching the movie, all I can say is WOW. Not because I watched it on 3D but because you heard it from a true Marvelites, lol. Oh Stan Lee, I'm sorry but I don't want telling a lie, you know - (bawi na lang tayo ulit, Avengers 2 hehe, EXCELSIOR). Oops, speaking of excelsior - next is Silver Linings Playbook (**cliffhanger**), lol. How about you, did you like the reboot?